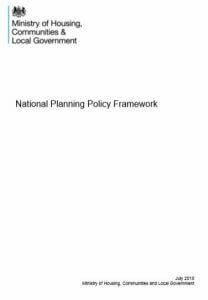 After much anticipation in planning circles the revised National Planning Policy Framework was published by the Ministry of Housing Communities & Local Government on Tuesday 24th July 2018. The update comes 6 years after the original NPPF was published by the Conservative Government as part of its plan to simplify and streamline the planning process. The revised (and slightly expanded) version of the NPPF still seeks to drive the sustainability agenda, setting out to ensure that development secures gains across the three overarching objectives of the planning system; the economic, social and environmental objectives. The presumption in favour of sustainable development remains at the forefront of plan making and decision taking and, in this regard, little has changed from the original document. Unsurprisingly the revised NPPF maintains the emphasis on significantly boosting the supply of homes, a welcome position given the chronic national housing shortage. There is an increased focus on the delivery of houses and of particular interest to some of our clients will be the specific importance placed on the delivery of small and medium sized housing sites. The NPPF states that they can make an important contribution in meeting the housing requirements of an area as they ‘are often built-out relatively quickly‘. The legislative requirement for self and custom build housing along with the vacant building credit have now been integrated into the revised framework. These are two areas that SFP as a practice has developed particular experience in recent times. It’ll take a while for the full implications of the revisions made to NPPF to be understood, but as always we’re happy to discuss the latest changes and what they might mean for your development aspirations… get in touch!